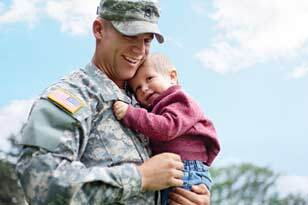 At Regions, we are committed to supporting the men and women of the U.S. military and their families. We understand that as a service member, you face unique challenges. Frequent moves, active duty requirements, overseas deployment – all of these can make managing your finances more complicated. We’re proud to help support you and your family. Regions is committed to providing its service members and their families with the benefits needed to keep them in financial control. For more information on this organization, visit the Support Our Soldiers website. Financial tools, tips, and calculators to help you confidentially manage your money and move your life forward. Protect Your Assets While You Serve - You defend our nation; now let us help you defend your personal matters. Reasons to Buy Life Insurance at Every Stage - Whether you're in your 20s or your 60s, we explain what coverage may be needed. Tips to Avoid Checking Account Mistakes - A Checking account is a great financial planning tool, but it needs to be managed properly to avoid mistakes like overdrawing your account. Simple Ways to Build an Emergency Fund – Emergencies happen, and can be expensive. We have four simple ways to start saving and get on track. Becoming A Millionaire Calculator	-	Everybody wants to be a millionaire, but few factor inflation into the equation. Depending on the amount of time it takes you to save a million dollars, you might have to save even more in order to have a million dollars worth of purchasing power down the road. Retirement Savings Calculator	-	The starting point for any retirement plan is an understanding of what your retirement needs will be. That way, you'll have a goal to build toward. Savings Calculator	-	If you're already a saver, you might ask yourself the question "what if I save more"? Increasing your existing savings rate by even 1 percent can yield big results. And the longer you're able to save, the more you'll take advantage of compounding, the ability to earn interest on your re-invested earned interest. Saving Towards A Goal Calculator	-	Whether you're trying to save for big screen television, new car or for a down payment on a new home, time, money and rate of return will all be determinant factors of when you'll meet your savings goal. Emergency Savings Calculator	-	It’s always a good idea to have savings tucked away for a rainy day. Emergencies such as legal or medical bills or loss of a job can all force you into “rainy day” mode. Plan now to be ready for tomorrow. What Will By Savings Be Worth Calculator	-	The future value of your savings plan is dependent on the starting balance, additional monthly savings and the rate of return you receive on those savings. For the most accurate valuation, you'll have to separate taxable accounts such as savings and CDs from your tax-deferred accounts such as 401(k)s and college 529 plans. Spare Change Calculator - Most people have a cup, jar or piggy bank full of change that they fill each day when they empty their pockets or clean out their purses. But how much do you have? Count it up and take a look! All deposit accounts are subject to the Regions Deposit Agreement, including the Pricing Schedule. Loans are subject to credit approval and terms and conditions of loan agreements. All services may not be available at all Regions locations. *If you provide your Military ID when opening a Regions checking account or anytime afterwards, we'll waive the ATM fee on two non-Regions ATM withdrawals from that Regions checking account for each statement cycle. Although we'll waive these fees for these non-Regions ATMs, the ATM owner may still charge a fee. If you provide a nonmilitary ID when opening or using your Regions account, our systems may not recognize that you qualify for the fee waiver on two transactions at non-Regions ATMs per statement cycle. If your account is charged a fee for a transaction at a non-Regions ATM, please visit a branch to provide your Military ID or, if there are no branches where you are deployed, call 1-855-REG-4MIL (734-4645) or complete the Regions Commitment to the Military ATM Benefits Exception Process Form and provide the documentation required to receive the benefit.